This extensive course for financial valuation and modeling in Excel covers corporate valuation, advanced financial modeling and Excel best practices to provide the skills and tools for a wide range of corporate finance analysis requirements. Course content is always available and includes the most important topics taught in large financial institutions and top MBA programs. Understand and apply valuation techniques used by finance practitioners and bankers. Conduct advanced financial statement analysis. In-depth knowledge of public and acquisition comparable analysis. Valuation via the discounted cash flow analysis. Identify strategic buyer affordability through merger consequence analysis. Quantify financial buyer affordability through leveraged buyout analysis. Valuation presentation and marketing financial deals. Monitor life cycle of initial public offerings (IPO) and merger and acquisition transactions. 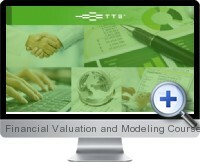 Build Excel based valuation models used by financial industry practitioners. Construct a financial model that to analyze a business from an operating, investing, financing, and valuation perspective. Understand foundations of financial modeling including model setup, establishing assumptions and creating formulas. Creation of pro-forma financial statements for analysis. Efficiently analyze financial disclosure to extract the information needed for financial modeling. Create a dynamic financial model with supporting time based data and robust analysis. Tools for troubleshooting financial models and avoiding errors. Excel best practices information with scenario analysis and advanced troubleshooting advice. Lifetime access to over 300 lectures and 32 hours of video content. Allows to be more proficient in both Excel and modeling standards used in finance. Enhance and correct existing financial models.